The steadily increasing use of contrast media in radiological and interventional cardiac procedures has led to more research and well designed studies of prophylactic strategies for its leading life threatening side effect of contrast induced nephropathy (CIN). CIN adversely affects the prognosis after interventional procedure and poses substantial extra burden on health care costs. The importance of understanding of CIN lies in the fact that no available treatment can reverse or ameliorate it once it develops, but prevention is possible. Herein, we discuss the detailed pathophysiological aspects, risk factors, proposed risk prediction algorithms and various prophylactic strategies for contrast induced nephropathy. At present our understanding of pathophysiology of CIAKI is still incomplete but the multiple pathways [Figure 1] that are shown to be involved include alteration in renal hemodymamics with vasoconstriction, renal ischemia with hypoxia, altered rheological properties due to osmolarity of CM affecting renal milieu and tubuloglomerular feedback, various autocrine and paracrine factors, and direct cellular toxicity of CM. Renal ischemia and hypoxia: In experimental models of CIAKI, the kidneys show pathologic ischemic changes with necrosis of thick ascending limbs as well as tubular collapse specially in the outer medulla. After a transient increase in renal blood flow, contrast induces overall ~50% sustained reduction in renal blood flow that persists for several hours. Renal medullary hypoxia has a major role in the pathogenesis of CIAKI. Even in the normal circumstances, oxygenation in the renal medulla is poor, making it more vulnerable to hypoxia. The oxygen requirements are high in the medulla due to salt reabsorption in the thick ascending loop of henle, while oxygen delivery is poor. The low oxygen supply is due to greater distance between DVR that supply the blood to outer medulla. The CM further aggravates the oxygen demand-supply mismatch. The hyperosmolar contrast agents induce osmotic diuresis that causes increased work in the active transport of molecules and low oxygen tension is more aggravated by vasoconstriction. It has also been shown that CM reduces oxygen tension in both medulla as well as the renal cortex. Increased oxidative stress: The renal ischemia induces the formation of reactive oxygen species (ROS) which causes the disbalance between vasodilatory nitric oxide and vasoconstrictive free radicals and initiates the vicious cycle of vasoconstriction and more generation of ROS. Nitric oxide bioavailability in vasa reacta is reduced by CM and free radical such as superoxide concentration is increased. The CM promotes endothelial cell death  by apoptosis and that leads to further decrease in nitric oxide synthesis. The pathophysiological role of adenosine in CIN is also explained by its tendency to generate ROS. The major role of N-acetyl cysteine and sodium bicarbonate in prevention of CIN is because of its ability to mitigate the oxidative stress. Direct cellular toxicity of CM: The direct cytotoxic effects of CM may rely on iodine which has been shown to have toxicity on human cells and bacteria. Iodine can be released from CM by photolysis. The rate of photolysis of CM is influenced by the storage time and exposure to light. A number of experimental studies has shown that CM can cause cell membrane damage, proximal cell vacuolization, interstitial inflammation, cellular necrosis, and enzymuria. , The stasis of contrast in kidney allows cellular toxicity and death of renal tubular cells. Hyperosmolar solutions result in cell shrinkage and also influence the shape and size of erythrocytes; thus hampering their passage through narrow vessels, which creates renal hypoperfusion. CM properties: A direct positive correlation has been shown between osmolality of CM and nephrotoxicity. Using low osmolar contrast (osmolalities: 400-800 mosmol/kg H 2 O) in comparison to Hyperosmolar contrast solutions (osmolalities 1000-2500 mosmol/kg H 2 O) results in reduced incidence of CIAKI. As water is reabsorbed along the length of tubule, CM becomes concentrated with its passage, which increases tubular fluid osmolality. The highly viscous CM have a prolonged contact time with the tubular epithelial cells, and accordingly tubular damage is greater, as indicated by biomarkers. The ionic CM (iothalamate, diatrizoate, and metrizoate) have high osmolality and require two osmotically active particles to deliver three iodine atoms. Nonionic CM (iopromide, iohexol, ioversol, and iopamidol) have low osmolality as they require only one osmotically active particle to deliver three iodine atoms. The ioxalate is an ionic dimmer which has osmolality of 600 mosmol/kg, similar to low osmolar CM. The newer contrast agent iodixanol is a nonionic dimmer in which six iodine atoms are attached to one osmotically active article and thus it is iso-osmolar with plasma (300 mosmol/kg of H 2 O). 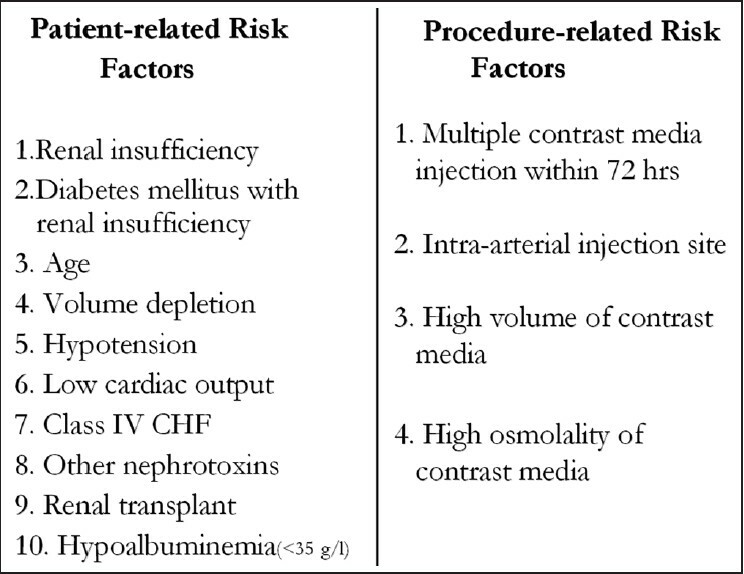 The various risk factors have a causative role in the development of contrast induced acute kidney injury and many of the indicators of risk are nonmodifiable [Figure 2]. Baseline renal dysfunction: Preexisting renal insufficiency is the single major risk factor for CIAKI. Baseline renal filtration function is a surrogate marker for reduced nephron mass and renal parenchymal function. The risk of CIN is increased in patients with an estimated GFR (eGFR) of <60 mL/min/m 2 of the body surface area. The approximate percent risk of CIN can be calculated by multiplying SCr concentration in mg/dL by 10. Diabetes mellitus: The risk of developing CIN in diabetic patients is greater when diabetic nephropathy or baseline renal insufficiency is present. The need for dialysis in this group of patients who progress to CIN is greater as they commonly develop oliguria. Proteinuria is also an important risk marker for development of CIN. Hemodynamic instability: A large series of PCI patients have shown an association between CIN and indicators of hemodynamic instability such as periprocedural hypotension and use of an intra-aortic balloon pump. , Hypotension significantly increases risk of CIN as it causes renal ischemia. Advanced age, hypertension, nephrotoxic drugs, gout, volume depletion, and hyperviscous states (multiple myeloma) are other risk factors for development of CIAKI. The effect of risk factors is additive and the likelihood of CIN increases as the number of risk factor increases. 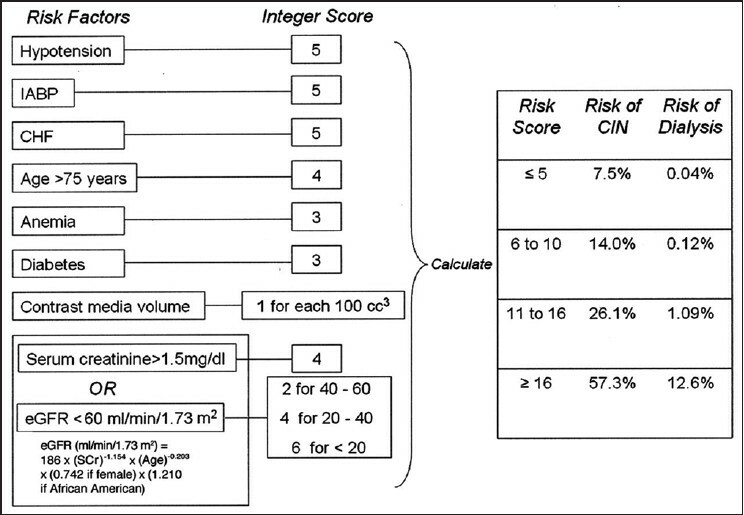 A number of CIN risk prediction models have been proposed the best known being of Mehran et al.,  [Figure 3]. In this risk prediction score, a number of clinical variables related to age, hemodynamic instability, diabetes, and eGFR are summated yielding an integer score that is directly related to risk of CIN and hemodialysis. A score ≤5 is associated with a risk of CIN of ≤7.5% and a risk of dialysis of 0.04%. In contrast, a score ≥16 is associated with ≥50% likelihood of CIAKI, and a risk of dialysis of over 12%. Currently many preventive measures have been tried which affect different pathogenetic mechanisms of CIN, but only few have shown real efficacy. The measures which failed to show any benefit in well-designed trials include dopamine, diuretics, atrial natriuretic peptide, fenoldopam, endothelin receptor antagonists, and L-Arginine. Selection of CM: Over several few years CM have been refined to lower osmolalities levels. Red blood cell deformation, systemic vasodilation, intrarenal vasoconstriction, as well as direct renal tubular toxicity are all more common in contrast agents with osmolality greater than that of blood (>300 mosmol/kg). In a meta-analysis of studies before 1992, the pooled odds ratio (OR) for the incidence of CIN events (rise in SCr of >0.5 mg/dL in 25 trials was 0.61), 95% confidence interval (CI) 0.48-0.77, indicating a significant reduction in risk with low osmolar CM compared with that seen with high osmolar CM. The other studies supported this finding subsequently. Iodixanol has the lowest risk of CIN in diabetes and chronic renal insufficiency. , In a meta-analysis of 16 head-to-head, randomized trials (2,727 patients) of intra-arterial contrast medium, the incidence of CIN was significantly lower with iodixanol than with low osmolar CM. Iotrolan is an another iso-osmolar contrast agent that is associated with lower incidence of CIN, but it is not approved for intravascular use. The American College of Cardiology/American Heart Association guidelines for the management of acute coronary syndromes patients with CKD listed the use of iso-osmolar contrast as a class I, level of Evidence: A recommendation. The volume of CM is also a significant risk factor for CIAKI and even small volumes of CM can have detrimental effects in persons at high risk. As a general rule, the volume of contrast received should not exceed twice the baseline level of eGFR in milliliters. In patient with CKD a diagnostic catheterization should plan to use <30 mL of contrast, and if followed by PCI then <100 mL should be a reasonable goal. N-acetyl cysteine is an antioxidant that has not been shown to be consistently effective in reduction of CIN, in trials. N-acetyl cysteine reduces skeletal muscle creatinine production; and thus, falsely appear to lower creatinine and not fundamentally prevent CIN. In one trial of primary percutaneous intervention, NAC lowered the rates of CIN. The REMEDIAL (Renal Insufficiency Following Contrast Media Administration) trial showed that a combination of NAC and volume expansion with sodium bicarbonate was more effective than NAC alone. Although NAC is safe and effective, its value in preventing CIN remain controversial. The data regarding theophylline use are mixed and favorable studies had limitations of small sample size, absence of high risk patients, and failure to show differences in the incidence of CIN. Multiple studies have shown that statin reduce the rate of AKI during PCI and coronary artery bypass surgery (CABG). Preservation of endothelial function at the level of the glomerulus and decrease in systemic inflammatory factors are postulated mechanisms by which statins may have renoprotective effects. Nonsteroidal anti-inflammatory drugs (NSAIDS) and other renotxic drugs should be discontinued prior to the procedure. Hemodialysis and hemofiltration: Several studies have shown that 2-3 h of hemodialysis removes 60-90% of the contrast medium. However, the prophylactic value of hemodialysis in high risk patients, in preventing CIN has not been shown. In one study, hemofiltration significantly reduced CIN in high risk patients. Hemofiltration works to ensure adequate intravascular volume, reduces uremic toxins that may worsen AKI, and provides stability to the high-risk patient after the procedure, reducing the risks of oliguria, volume overload, and electrolyte imbalance. Until the results of large randomized trials regarding efficacy of hemofiltration are available, it cannot be recommended as standard prophylaxis in every high risk patient. The need for a better marker of renal function than SCr is highly justified as SCr is an indirect and insensitive marker of kidney function. Neutrophil gelatinase associated lipocalin  and cystatin-C have demonstrated to be sensitive markers of early kidney injury and GFR, respectively. Various novel approaches are in pipeline for prevention of CIN. Coronary sinus withdrawal of blood and contrast after intracoronary injection of contrast during coronary angiography, and thus reducing the amount of contrast delivered to kidneys, has been tested in experimental models. Other strategies include use of intravenous antioxidants, forced hydration, and new less toxic contrast agents. CIAKI is commonly encountered in clinical practice due to increasing number of interventional cardiology and radiological procedures. CIN can occur due to multiple pathogenetic pathways which have a complex interaction with each other. Appropriate identification of individuals at high risk of CIN using risk prediction models is mandatory. An integrated approach [Figure 4] utilizing volume expansion, limiting amount of CM, use of novel isoosmolar contrast agents, and efficacious pharmacological intervention should be used to prevent the development of CIAKI. 1. Lameire N, Van Biesen W, Vanholder R. Acute renal failure. Lancet 2005;365:417-30. 2. 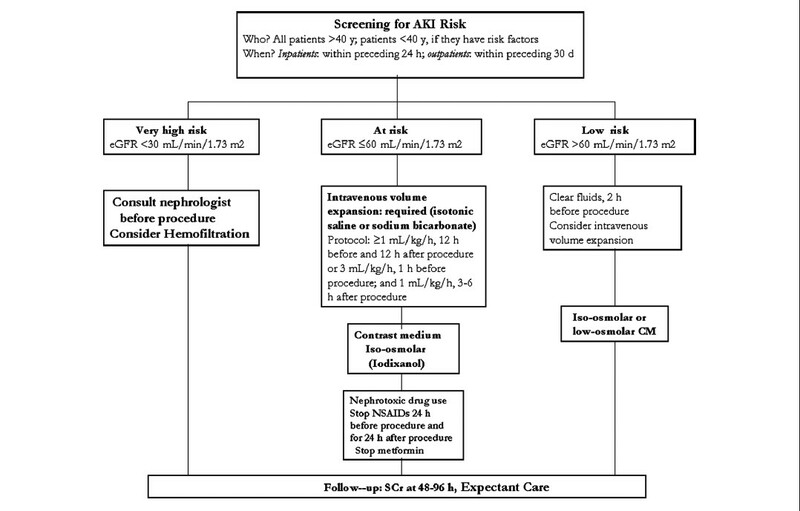 Nikolsky E, Aymong ED, Dangas G, Mehran R. Radiocontrast nephropathy: Identifying the high risk patient and the implications of exacerbating renal function. Rev Cardiovasc Med 2003;4 (Suppl 1):S7-14. 3. Murphy SW, Barrett BJ, Parfrey PS. Contrast nephropathy. J Am Soc Nephrol 2000;11:177-82. 4. Maeder M, Klein M, Fehr T, Rickli H. Contrast nephropathy: Review focusing on prevention. J Am Coll Cardiol 2004;44:1763-71. 5. Gleeson TG, Bulugahapitiya S. Contrast-induced nephropathy. AJR Am J Roentgenol 2004;183:1673-89. 6. Molitoris BA, Levin A, Warnock DG, Joannidis M, Mehta RL, Kellum JA, et al. Acute Kidney Injury Network Working Group. Improving outcomes of acute kidney injury: Report of an initiative. Nat Clin Pract Nephrol 2007;3:439-42. 7. Mehta RL, Kellum JA, Shah SV, Molitoris BA, Ronco C, Warnock DG, et al. Acute Kidney Injury Network: Report of an initiative to improve outcomes in acute kidney injury. Crit Care 2007;11:R31. 8. Bartholomew BA, Harjai KJ, Dukkipati S, Boura JA, Yerkey MW, Glazier S, et al. Impact of nephropathy after percutaneous coronary intervention and a method for risk stratification. Am J Cardiol 2004;93:1515-9. 9. Rihal CS, Textor SC, Grill DE, Berger PB, Ting HH, Best PJ, et al. Incidence and prognostic importance of acute renal failure after percutaneous coronary intervention. Circulation 2002;105:2259-64. 10. Solomon RJ, Mehran R, Natarajan MK, Doucet S, Katholi RE, Staniloae CS, et al. Contrast-induced nephropathy and long-term adverse events: Cause and effect? Clin J Am Soc Nephrol 2009;4:1162-9. 11. McCullough PA, Wolyn R, Rocher LL, Levin RN, O'Neill WW. Acute renal failure after coronary intervention: Incidence, risk factors, and relationship to mortality. Am J Med 1997;103:368-75. 12. Nikolsky E, Mehran R, Turcot D, Aymong ED, Mintz GS, Lasic Z, et al. Impact of chronic kidney disease on prognosis of patients with diabetes mellitus treated with percutaneous coronary intervention. Am J Cardiol 2004;94:300-5. 13. Marenzi G, Lauri G, Assanelli E, Campodonico J, De Metrio M, Marana I, et al. Contrast-induced nephropathy in patients undergoing primary angioplasty for acute myocardial infarction. J Am Coll Cardiol 2004;44:1780-5. 14. Rudnick MR, Berns JS, Cohen RM, Goldfarb S. Contrast media-associated nephrotoxicity. Semin Nephrol 1997;17:15-26. 15. Wang A, Holcslaw T, Bashore TM, Freed MI, Miller D, Rudnick MR, et al. Exacerbation of radiocontrast nephrotoxicity by endothelin receptor antagonism. Kidney Int 2000;57:1675-80. 16. Pflueger A, Larson TS, Nath KA, King BF, Gross JM, Knox FG. Role of adenosine in contrast media-induced acute renal failure in diabetes mellitus. Mayo Clin Proc 2000;75:1275-83. 17. Katzberg RW, Morris TW, Burgener FA, Kamm DE, Fischer HW. Renal renin and hemodynamic responses to selective renal artery catheterization and angiography. Invest Radiol 1977;12:381-8. 18. Heyman SN, Brezis M, Reubinoff CA, Greenfeld Z, Lechene C, Epstein FH, et al. Acute renal failure with selective medullary injury in the rat. J Clin Invest 1988;82:401-12. 19. Tumlin J, Stacul F, Adam A, Becker CR, Davidson C, Lameire N, et al. Pathophysiology of contrast-induced nephropathy. Am J Cardiol 2006;98:14-20K. 20. Persson PB, Hansell P, Liss P. Pathophysiology of contrast medium-induced nephropathy. Kidney Int 2005;68:14-22. 21. Sendeski MM. 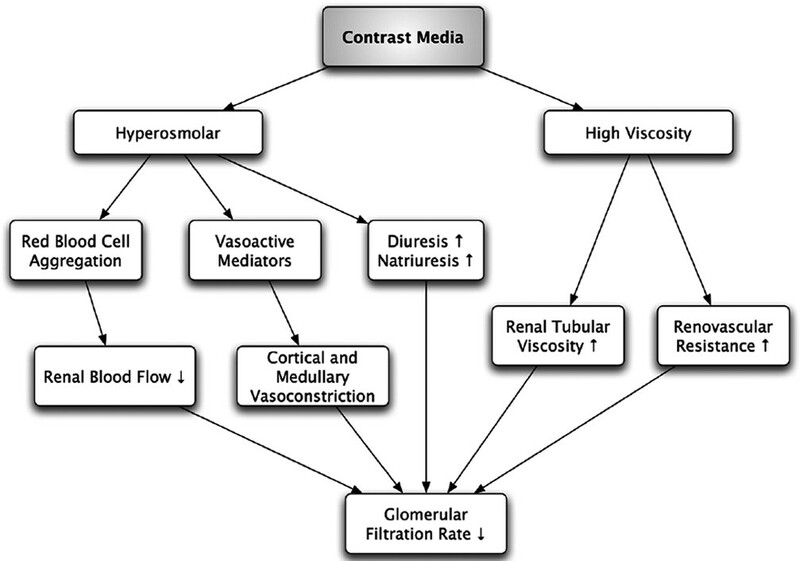 The pathophysiology of renal tissue damage by iodinated contrast media. Clin Exp Pharmacol Physiol 2011;38:292-9. 22. Heyman SN, Brezis M, Epstein FH, Spokes K, Silva P, Rosen S. Early renal medullary hypoxic injury from radiocontrast and indomethacin. Kidney Int 1991;40:632-42. 23. Sendeski M, Patzak A, Pallone TL, Cao C, Persson AE, Persson PB. Iodixanol, constriction of medullary descending vasa recta, and risk for contrast medium-induced nephropathy. Radiology 2009;251:697-704. 24. Aliev G, Obrenovich ME, Seyidova D, Rzayev NM, Aliyev AS, Raina AK, et al. X-ray contrast media induce aortic endothelial damage, which can be prevented with prior heparin treatment. J Submicrosc Cytol Pathol 2003;35:253-66. 25. Bakris GL, Lass N, Gaber AO, Jones JD, Burnett JC Jr. Radiocontrast medium-induced declines in renal function: A role for oxygen free radicals. Am J Physiol 1990;258(1 Pt 2):F111-20. 26. Eloy R, Corot C, Belleville J. Contrast media for angiography: Physicochemical properties, pharmacokinetics and biocompatibility. Clin Mater 1991;7:89-197. 27. Barrett BJ, Carlisle EJ. Meta-analysis of the relative nephrotoxicity of high- and low-osmolality iodinated contrast media. Radiology 1993;188:171-8. 28. Jost G, Pietsch H, Sommer J, Sandner P, Lengsfeld P, Seidensticker P, et al. Retention of iodine and expression of biomarkers for renal damage in the kidney after application of iodinated contrast media in rats. Invest Radiol 2009;44:114-23. 29. Manske CL, Sprafka JM, Strony JT, Wang Y. Contrast nephropathy in azotemic diabetic patients undergoing coronary angiography. Am J Med 1990;89:615-20. 30. Cigarroa RG, Lange RA, Williams RH, Hillis LD. Dosing of contrast material to prevent contrast nephropathy in patients with renal disease. Am J Med 1989;86(6 Pt 1):649-52. 31. Kane GC, Doyle BJ, Lerman A, Barsness GW, Best PJ, Rihal CS. Ultra-low contrast volumes reduce rates of contrast-induced nephropathy in patients with chronic kidney disease undergoing coronary angiography. J Am Coll Cardiol 2008;51:89-90. 32. Rudnick MR, Goldfarb S, Wexler L, Ludbrook PA, Murphy MJ, Halpern EF, et al. The Iohexol Cooperative Study. Nephrotoxicity of ionic and nonionic contrast media in 1196 patients: A randomized trial. Kidney Int 1995;47:254-61. 33. Dangas G, Iakovou I, Nikolsky E, Aymong ED, Mintz GS, Kipshidze NN, et al. Contrast-induced nephropathy after percutaneous coronary interventions in relation to chronic kidney disease and hemodynamic variables. Am J Cardiol 2005;95:13-9. 34. Lindsay J, Apple S, Pinnow EE, Gevorkian N, Gruberg L, Satler LF, et al. Percutaneous coronary intervention-associated nephropathy foreshadows increased risk of late adverse events in patients with normal baseline serum creatinine. Catheter Cardiovasc Interv 2003;59:338-43. 35. Mehran R, Aymong ED, Nikolsky E, Lasic Z, Iakovou I, Fahy M, et al. A simple risk score for prediction of contrast-induced nephropathy after percutaneous coronary intervention: Development and initial validation. J Am Coll Cardiol 2004;44:1393-9. 36. Aspelin P, Aubry P, Fransson SG, Strasser R, Willenbrock R, Berg KJ, et al. Nephrotoxicity in High-Risk Patients Study of Iso-Osmolar and Low-Osmolar Non-Ionic Contrast Media Study Investigators. Nephrotoxic effects in high-risk patients undergoing angiography. N Engl J Med 2003;348:491-9. 37. Chalmers N, Jackson RW. Comparison of iodixanol and iohexol in renal impairment. Br J Radiol 1999;72:701-3. 38. McCullough PA, Bertrand ME, Brinker JA, Stacul F. A meta-analysis of the renal safety of isosmolar iodixanol compared with low-osmolar contrast media. J Am Coll Cardiol 2006;48:692-9. 39. Laskey WK, Jenkins C, Selzer F, Marroquin OC, Wilensky RL, Glaser R, et al. NHLBI Dynamic Registry Investigators. Volume-to-creatinine clearance ratio: A pharmacokinetically based risk factor for prediction of early creatinine increase after percutaneous coronary intervention. J Am Coll Cardiol 2007;50:584-90. 40. Mueller C, Buerkle G, Buettner HJ, Petersen J, Perruchoud AP, Eriksson U, et al. Prevention of contrast media-associated nephropathy: Randomized comparison of 2 hydration regimens in 1620 patients undergoing coronary angioplasty. Arch Intern Med 2002;162:329-36. 41. Brar S. A randomized controlled trial for the prevention of contrast induced nephropathy with sodium bicarbonate vs. sodium chloride in persons undergoing coronary Angiography (the MEENA Trial). Paper presented at: 56 th Annual Scientific Session of the American College of Cardiology; March 24-27, 2007; New Orleans, Louisiana. 42. Taylor AJ, Hotchkiss D, Morse RW, McCabe J. PREPARED: Preparation for Angiography in Renal Dysfunction: A randomized trial of inpatient vs outpatient hydration protocols for cardiac catheterization in mild-tomoderate renal dysfunction. Chest 1998;114:1570-4. 43. Stevens MA, McCullough PA, Tobin KJ, Speck JP, Westveer DC, Guido-Allen DA, et al. A prospective randomized trial of prevention measures in patients at high risk for contrast nephropathy: Results of the P.R.I.N.C.E. study. Prevention of Radiocontrast Induced Nephropathy Clinical Evaluation. J Am Coll Cardiol 1999;33:403-11. 44. Solomon R, Werner C, Mann D, D'Elia J, Silva P. Effects of saline, mannitol, and furosemide to prevent acute decreases in renal function induced by radiocontrast agents. N Engl J Med 1994;331:1416-20. 45. Briguori C, Visconti G, Focaccio A, Airoldi F, Valgimigli M, Sangiorgi GM, et al. Renal Insufficiency After Contrast Media Administration Trial II (REMEDIAL II): RenalGuard System in High-Risk Patients for Contrast-Induced Acute Kidney Injury. Circulation 2011;124:1260-9. 46. Marenzi G, Ferrari C, Marana I, Assanelli E, DeMetrio M, Teruzzi G, et al. Prevention of contrast nephropathy with furosemide-induced diuresis and matched hydration-The MYTHOS trial. JACC Cardiovas Interven 2011;5:90-7. 47. Spargias K, Alexopoulos E, Kyrzopoulos S, Iokovis P, Greenwood DC, Manginas A, et al. Ascorbic acid prevents contrast-mediated nephropathy in patients with renal dysfunction undergoing coronary angiography or intervention. Circulation 2004;110:2837-42. 48. Marenzi G, Assanelli E, Marana I, Lauri G, Campodonico J, Grazi M, et al. N-acetylcysteine and contrast-induced nephropathy in primary angioplasty. N Engl J Med 2006;354:2773-82. 49. Briguori C, Airoldi F, D'Andrea D, Bonizzoni E, Morici N, Focaccio A, et al. Renal insufficiency following contrast media administration trial (REMEDIAL): A randomized comparison of 3 preventive strategies. Circulation 2007;115:1211-7. 50. Erley CM, Duda SH, Schlepckow S, Koehler J, Huppert PE, Strohmaier WL, et al. Adenosine antagonist theophylline prevents the reduction of glomerular filtration after contrast media application. Kidney Int 1994;45:1425-31. 51. Khanal S, Attallah N, Smith DE, Kline-Rogers E, Share D, O'Donnell MJ, et al. Statin therapy reduces contrast-induced nephropathy: An analysis of contemporary percutaneous interventions. Am J Med 2005;18:843-9. 52. Sterner G, Frennby B, Kurkus K, Nyman U. Does post-angiographic hemodialysis reduce the risk of contrast medium nephropathy? Scand J Urol Nephrol 2000;34:323-6. 53. Marenzi G, Marana I, Lauri G, Assanelli E, Grazi M, Campodonico J, et al. The prevention of radiocontrast agent induced nephropathy by hemofiltration. N Engl J Med 2003;349:1333-40. 54. Bachorzewska-Gajewska H, Malyszko J, Sitniewska E, Malyszko JS, Dobrzycki S. Neutrophil-gelatinase-associated lipocalin and renal function after percutaneous coronary interventions. Am J Nephrol 2006;26:287-92. 55. Movahed MR, Wong J, Molloi S. Removal of iodine contrast from coronary sinus in swine during coronary angiography. J Am Coll Cardiol 2006;47:465-7.